The Museum of Industry was the site of Berman McAleer’s dinner for its clients. The Museum is so interesting, and the view was lovely as we dined with a view of the harbor. 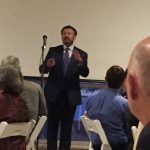 Anirban Basu, economist extraordinaire, and Chairman and CEO of the Sage Policy Group did not disappoint. Economics is a dry subject. Anirban is an economist and an entertainer. Only he, has the capability to take dry numbers, graphs, and trends, and make them interesting and entertaining. In a few words, we are doing pretty well, and he believes that will occur through 2019 as well. But, before every downturn, were several years of very high consumer confidence. We are on that high now and have been for several years. Thus, the lack of certainty beyond 2019. A trend he predicts is that within the next 5 years, single-family housing will boom when the millennials age, have children, and purchase instead of rent. If you have the opportunity to hear Mr. Basu speak, you should do so. You will not be disappointed. Berman McAleer is a wealth advisor, investment group, in which I have complete confidence. If you are looking for someone who will become part of your trusted advisory group, Berman McAleer is the answer. Over the years, I have worked with founding partner and CEO David Berman, and with Susan Mitcheltree. See what they can do for you at www.bmcplanning.com.